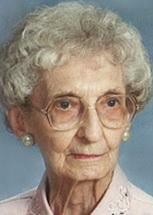 GILBERTVILLE — Bathildes C. “Beth” Bernardy, 90, of Gilbertville, died at home Friday, Aug. 2, 2013. She was born Aug. 27, 1922, in Gilbertville, daughter of Martin and Loretta Gardner Bernardy. She attended Immaculate Conception grade school, Gilbertville, and graduated from St. Mary’s High School, Waterloo, in 1939. She then attended St. Joseph’s School of Radiology, Milwaukee, Wis. She joined her father in the Martin Bernardy Insurance Agency and took over the agency when her father retired. For several years she was a volunteer at the Grout Museum, Waterloo. She was a member of the rosary society at Immaculate Conception Catholic Church. Survived by a brother, Benjamin (Bettie) Bernardy of San Diego; and many nieces and nephews. Preceded in death by: two brothers, Peter and Alphonse Bernardy. Services: 10:30 a.m. Saturday at Immaculate Conception Catholic Church, with burial in St. Mary’s Cemetery, both in Gilbertville. Visitation from 4 to 8 p.m. Friday at Hagarty-Waychoff-Grarup Funeral Service on South Street, Waterloo, with a 4 p.m. rosary and a 7 p.m. vigil. Visitation also an hour before services Saturday at the church. Memorials: may be made to the Bosco System.